The Lilja Zakirova Gallery is very pleased to invite you to the second exhibition by the Russian artist Raoef Mamedov. After the very successful photograph project in which Mamedov had taken famous paintings from art history as prototypes for his biblical representations staged by actors with Down’s syndrome, he now presents once again a remarkable project. The narrative of Adam and Eve and their expulsion from Paradise is the basis of a multiple piece of eight photograph panels the artist uses to depict his view on the story of the Creation. The panels were created in co-operation with a photographer and an expert in the field of digital photo compositions; compositions made up of several aspects of the narrative. Just like many mediaeval and early Renaissance artists Mamedov is showing different moments in history in one composition. By his way of depicting, the artist thus quotes from art history, and by his choice of the graphic idiom for his scenes he proves himself to be a post-modernist. So many artists have portrayed the various aspects of the creation of man as it was described in Genesis, and the beginning of loneliness after the Fall. In an original manner Mamedov alludes to works by artists such as Hugo van der Goes, Jan van Eyck, Albrecht Dürer and, partly, to Michelangelo in their depiction of Adam and Eve. Also Van Gogh and Picasso, in their portrayal of the human search for the balance between freedom and captivity of the soul, have their place in Mamedov’s work. The “actors” performing in his creations are residents of the psychiatric home where Mamedov used to work as a nurse some twenty years ago, and where he had special ties with one of its residents. It was the tragedy of the incapacity for real contact which he experienced in this friendship that inspired him to this creation. The separation between the conscious and subconscious human mind launched by the expulsion from Paradise had become painfully clear to the artist. The schizophrenic psychiatric patients he selected for his works of art have no control over the difference between the conscious and the subconscious and therefore are closer to the beginning of the history of mankind. The pointless labyrinth in which man has found himself ever since according to the artist, is a sequence of moments when he is looking for an escape from this reality. 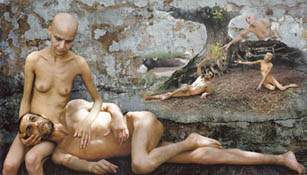 In this search the artist recognises an image of the Supreme Being; in his point of view Adam and Eve represent the Father’s Conscious and the Subconscious. In this new creation Raoef Mamedov proves himself to be an honourable and visionary artist who does not shun the confrontation with the audience.